Great presentation, fun to eat and great combination of Asian flavors. Black garlic and kimchi “caramels” with edible wrapper paired with a mirin and white miso dipping sauce. 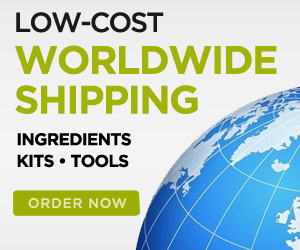 The edible wrapper has no flavor and disappears in the mouth right away. You first get the flavors of the mirin and miso in the mouth, which slowly start mixing with the black garlic as you bite into it and finally you get a full appreciation of the intense flavors of the black garlic and kimchi. If you haven’t tried black garlic before, you need to! I really enjoy combining black garlic with a good steak or roasted chicken. It adds a new dimension to the dish. Black garlic is like caramelized garlic and it is made by heating whole bulbs of garlic for several weeks in a carefully controlled environment. It has a sweet taste, with hints of balsamic vinegar and tamarind. It doesn’t have the pungent odor or causes the bad breath of raw garlic. If you are in the USA, you can now purchase black garlic at Trader Joe’s. 1- Place the black garlic and kimchi base in a small bowl and mash them with a fork until you have a smooth paste. 2- Prepare a silicone mat that fits your dehydrator or alternatively you can use parchment paper. 3- Using two small spoons, create small quenelles of black garlic paste (about 5g) and place them on the silicone mat. Using a small spatula flatten the edges to form a cylinder or rectangular shape. 4- Place the silicone mat in the dehydrator at 71 °C (160 °F) and wait for 3 hours. Using a spatula, flip the black garlic caramels after 1.5 hours so they dry evenly. This will make the caramels a little more chewy, will help with the wrapping and will eliminate any moisture on the surface that could “melt” the ultra-thin edible film. 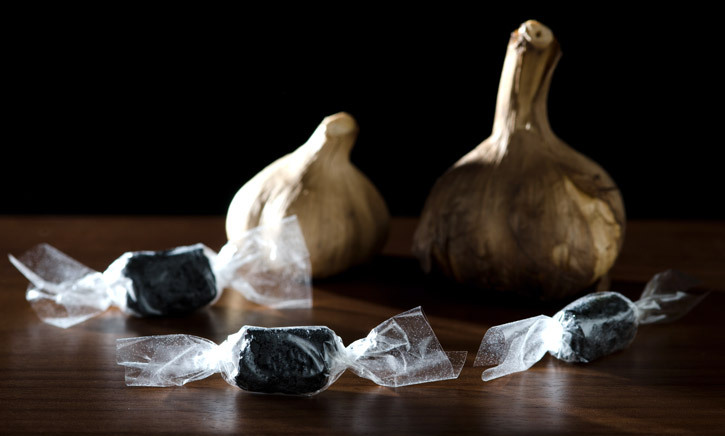 5- Store the black garlic caramels in a sealed container until serving time. 1- Blend the white miso paste with the mirin. 2- Add the xanthan gum and blend again thoroughly. 1- Cut the edible film to the right size for wrapping. When you wrap the caramels with the edible film you just want a little overlap of the paper. So depending on the size of caramels you made, you may have to cut the square edible film to make a rectangle. I usually cut about 2/3 inch from one side. 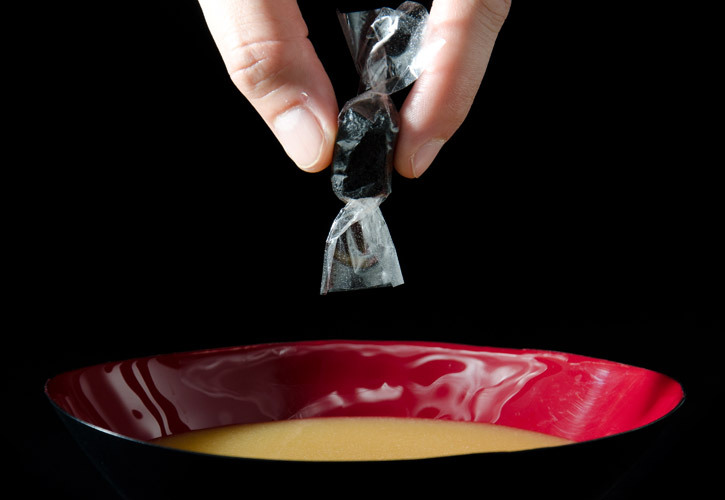 2- Place a caramel on the edge of one of the long sides and wrap it with the edible film. Carefully twist the ends of the wrap. 3- Pour the white miso sauce in a bowl. 4- Explain the diners they should dip a caramel in the sauce and immediately proceed to eat it.